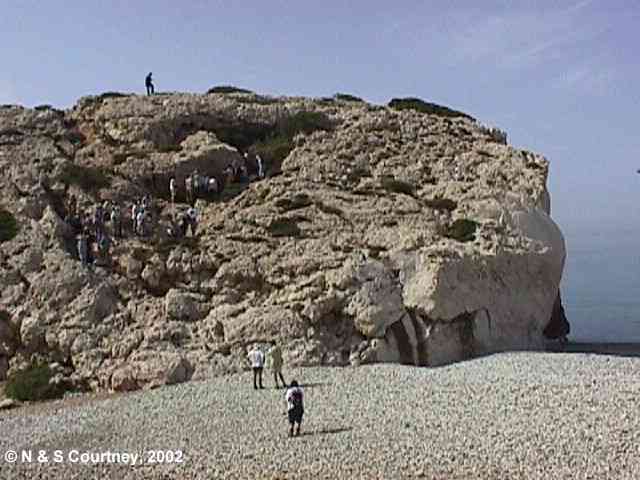 A group of 30 odd students from Hong Kong University, and 1 (Sue) from Auckland University, New Zealand, undertook a mapping exercise in south west Cyprus, outside Paphos, over 8 days in May and June, 1998. Each of the 10 groups of 3-4 students had an area of 1.5 km by 4 km to map. Prior to the official start of the geological portion of the trip, a general tour of the area, to look at the scenery, and drink some of the local wines was undertaken. This view is of Sue and the academics hard at work at the Chrysoroyiatissa Monastery. 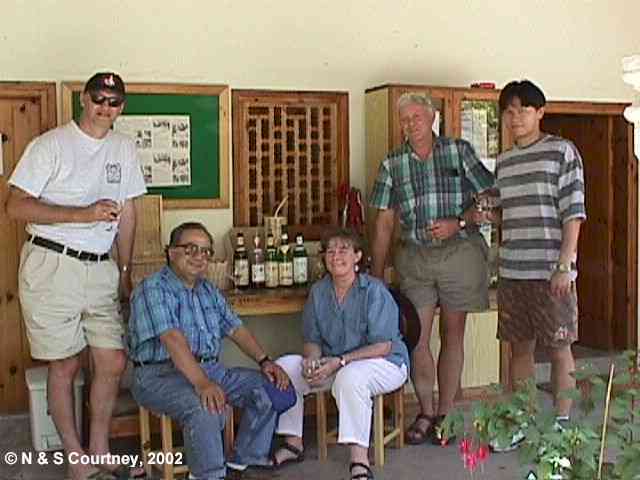 From left: Prof. John Malpas, Costas Xenophontos of the Cyprus Geological Survey, Sue, Prof. Ian Smith of The University of Auckland's Geology Dept and CK - a PhD student from Hong Kong University. 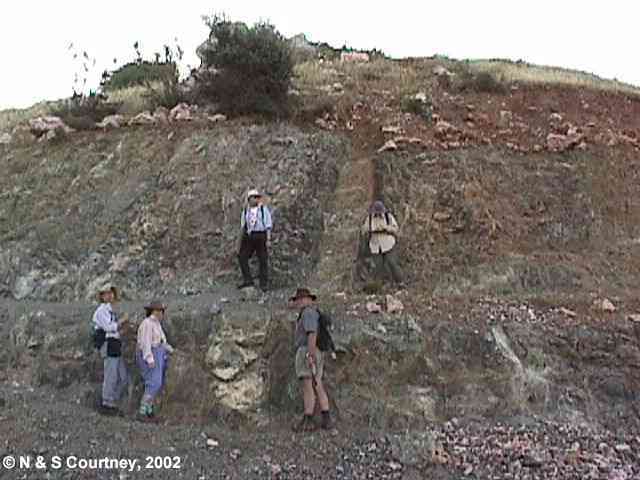 The area chosen by Prof. John Malpas, of Hong Kong University Geology Department, is in an area world renowned as being a classic Ophiolite structure. An introductory tour saw us stop first at Petra tou Romiou beach. 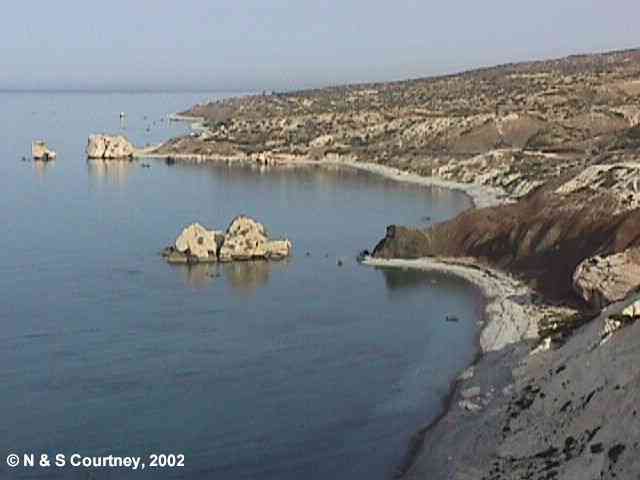 The limestone outcrop in the left background of picture 1 is the reputed birthplace of Aphrodite, goddess of love, or Venus in Roman terms. This location shows the full range of geology to be found in this area, from outcrops of limestone on the left through to the darker coloured volcanics in the middle foreground to the overlying cap of chalk and marl on the hill in the distance. 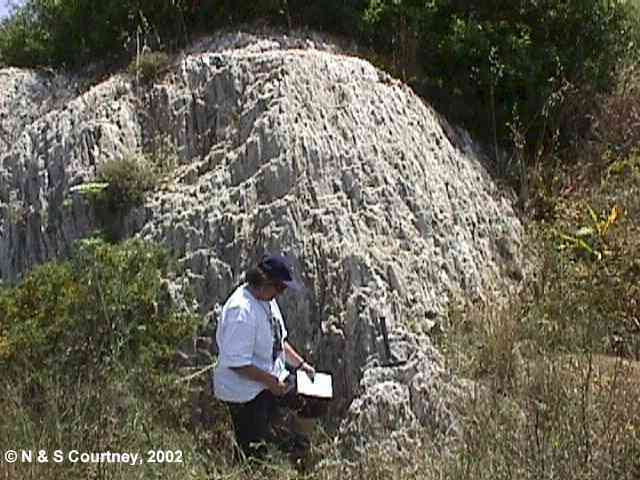 Picture 2 shows the volcanic outcrop being examined by students while picture 3 shows the largest limestone outcrop, near the top left of picture 1, being examined by students. The next stop was at this massive crystalline gypsum outcrop, which was in the Group 4 area. 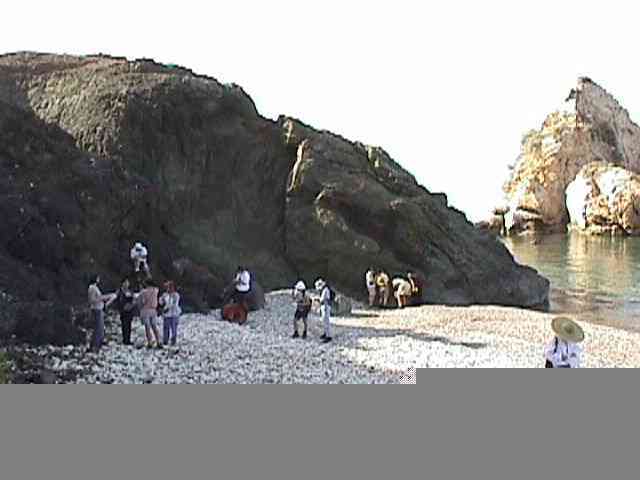 After leaving Petra tou Romiou we proceeded to the main mapping area, to introduce the students to some of the geological features to be found. 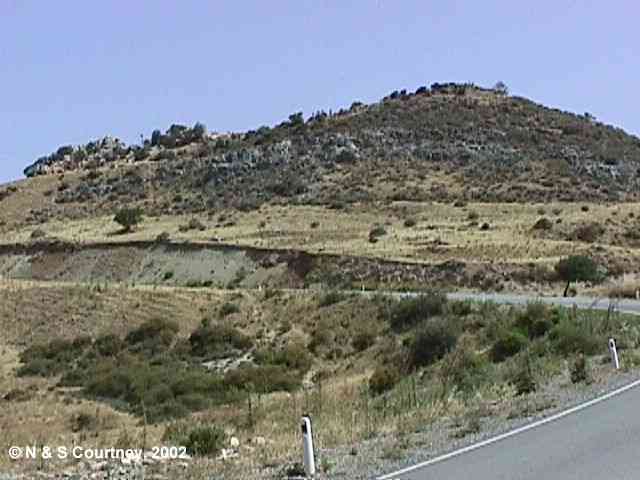 This hill, on the new road to Nata, was the first stop and was just outside the mapping area for Group 3, on the northern side. When the mapping started in earnest, the day started at 6:00am and ended, in the field, at about 1:00pm. The following photographs are from the Group 3 mapping area. The Team viewing a dyke intruding pillow lavas overlain by sediments. From left, Louis, Sue, Chris, Ian Smith (AU Geology Dept.) and Philip. 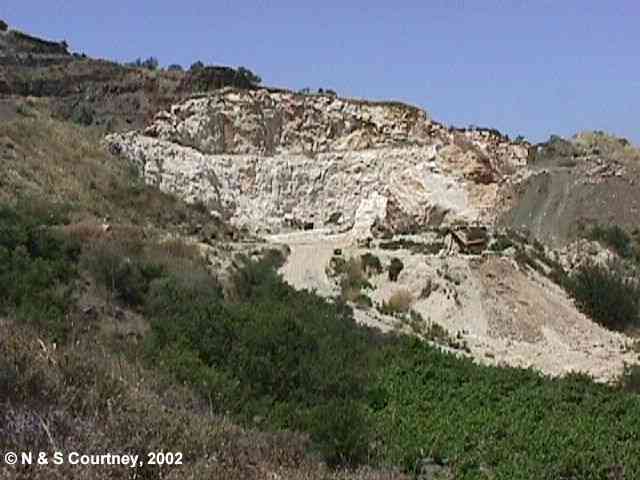 This large limestone quarry was on the western boundary of the mapping area. 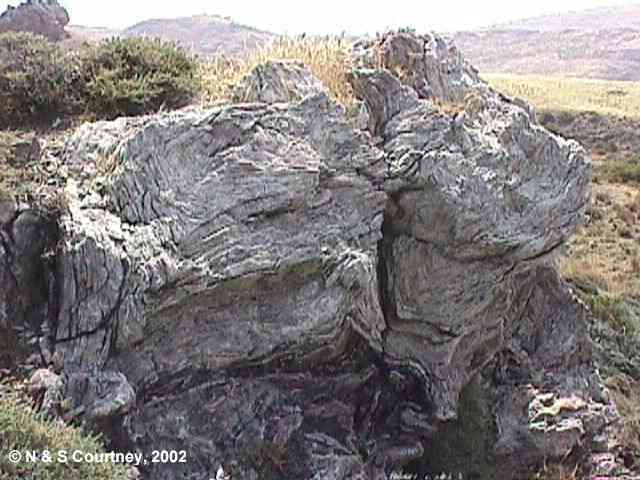 This wonderfully folded and contorted example of metamorphic rock was to be seen in the centre of the area.